A unique little Japanese house. Photo from Internet, source unknown. Over the next four months, our job is to downsize the possessions in our 2,000+ square foot home into 8 suitcases, and a couple dozen boxes that can either be stored or shipped a few at a time to our new home in Japan, which if we are lucky, will be approximately half the size of the one we currently live in. If we are unlucky, probably closer to a quarter of the size. To be honest, we’re not doing a great job of it. We’ve gone through a room and a couple cabinets and after sorting through so much stuff, it doesn’t seem like we’ve significantly thinned things out. In fact with Christmas coming, we may end up being right back where we started on December 26th. I’ve come to realize that the size of our homes in the United States are not necessarily a benefit to us. The vast majority of the world, even those who are considered “middle class” in their countries, live in homes much smaller than what Americans are used to. Our extended family in Tokyo live in a house where for many years, seven people had to share one bathroom. Talk about the phrase “Take a number”. We have three bathrooms and if one of the kids has to go downstairs to use one, they act like we’ve sent them on a shoeless trek to Siberia. We’ve lived in this house for over 10 years now, and though we’ve made a least some effort to control our material consumption, I am amazed at how quickly possessions can add up. I look at the shelves in our garage and I sweat bullets, knowing at some point I’m going to have to go out there and look inside them all and figure out what’s worth keeping. It’s a bit ludicrous and embarrassing that we have boxes in our garage that we don’t even know what is contained in them while many people in the world are living content with the clothes on their backs and a dirty mattress on the floor to sleep on. As much as I dislike the task of downsizing, I’m looking forward to the day when it’s finished. And I want to take a snapshot in my mind of that day about how free and light I feel on that day, to inspire me to avoid being a collector of material goods. My wife loves to watch the show “Hoarders”, but I can’t stand it. But at the very least, it is a strong reminder that you can’t take it with you. And when you are gone, most of your prized possessions simply become someone else’s mess to clean up. 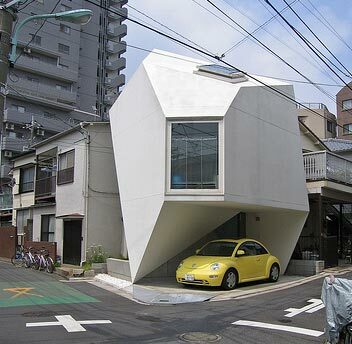 So we’re liking the idea of small spaces in Japan. I’m enjoying the thought of minimalism in furniture and modern conveniences that are unnecessary and create clutter. One cup coffee makers? Make a pot and invite friends over to enjoy it. Bread machines? Walk to the bakery and get a fresh loaf from a friendly baker. Vacuum cleaner? Get a dog (just kidding on that one). I hope America someday embraces the idea of homes that fit a family. You don’t buy pants with a 42 inch waist and say to yourself “Now I just have to eat enough butter until I fit them!” But we buy as big of a house as we can afford (or more likely, not afford) and buy enough possessions to fill it up, whether we need them or not. Perhaps the size of our homes is fueling our insatiable appetites for wanting more. So our downsizing project will continue through April and culminate with a huge garage sale followed by a huge Salvation Army run. But the lesson of downsizing is one I hope will stay in our hearts and minds for the rest of our lives.